If it was that simple, everybody who worked out would look like superman by now. Or perhaps the hulk. But yea, there's a little more to it than just working out. When you exercise to build muscle, you're giving your body a stimulus. That stimulus tells your body to start the internal hormonal (and other) machinery to happen and grow more muscle tissue. There are some powders and pills to take that will theoretically give you bigger muscles. But the best way to trigger your body to grow is to workout. I'd like to think of working out like doing damage to your body, rather than strengthening it. The rest afterward is what actually strengthens it. For example, say you cut yourself on the finger while cooking. This triggers you body to start a lot of processes, from the blood to start clotting almost immediately to healing the cut over the next few days and weeks. Working out is a lot like that. The workout damages your muscles, which triggers your body to start repairing them and growing them bigger to compensate and save you from the next time you're attacked by a rampaging bear - or go to the gym. I've found that kettlebell swings are my own 'secret weapon' exercise to build muscle. They're brutal, don't take that much time to do, and work like a charm. I've heard a lot about how squats are great for building leg strength and muscles. 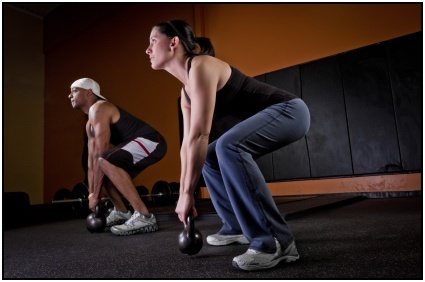 I like kettlebell swings more because there're easier to do deeper, and keep that full range of motion. One of that harder parts I find with squats, as you progress, is consistently keeping the squat deep as you add more and more weight. I know from personal experience how easy it is to fool yourself into thinking you're going deep, but aren't. With high reps, kettlebell swings keep you going deep. And then just keep doing that exercise to build muscle - beautiful, powerful leg muscle! I feel that high reps work wonders for building muscle on the legs. And kettlebells are beautiful for fooling yourself into doing a great workout. I'll do 50 swings for a few sets, be tired (but not dead), and the next day my gluteus and quads and everything in my legs are sore. It's great! After kettlebell swings, squats are my favorite exercise to build muscle. They share the same strengths as kettlebells, but you can find them in virtually any gym on earth. And if you can't find them, leave the gym. There's a very popular, and very old program, for adding muscle and strength to your leg. This exercise to build muscle program is called variously, 'squats and milk' or '20 rep squats'. This method is pretty brutal and intense, but its fundamentals are at the same ones I like to use in my leg work: high reps (15 - 30), eat a lot, increase the weight, and then high reps again. With a good amount of sleep and soreness in between the workouts. Maybe the back and legs have the biggest muscle groups, so you can get the most growth and muscle out of them the fastest? I sure hope you're asking that question by now because, hey, it's right! The deadlift is great for building muscle precisely because it's a big lift, and incorporates your big back and leg muscles. If you want top build muscle fast, work it! After you've exhausted the lower body exercises, then go to the upper body ones. And for the upper body, the bench press is one of the best. The bench press works your pectoral muscles, naturally, as well as everything in your arms (biceps, triceps, forearm muscles, etc. ), shoulders, and upper back. It's awesome. Of course, it focuses surely on the pressing movement (and leaves out the pulling movement). But it hits a lot of muscles, wears them out, and gives you the potential for lots of muscle growth. I like the standing shoulder press exercise to build muscle because it's harder than the bench press. You have to balance the weight while standing, rather than lying on a nicely cushioned bench. Now, you'll be lifting less weight in the press. And thus, won't be able to push your muscles to their limit as easily. But the standing press builds supporting muscles that are vital to using your strength in real situations. And I'm all about using my muscles in real life, whether it's grappling or lifting boxes. Only do jump squats if you don't have access to either kettlebells or barbells. Weighted exercises are the bomb for building muscle, and always use them if you can. If you don't have weights though, jump squats are the next best thing for working your lower body. Jump as high as you can, and make every effort to land softly and absorb the force of your landing. If you don't absorb the force of your landing, you'll just be beating up your ankle, knee, and hip joints - which will come back to haunt you later. Like a demon of aggravating pain, it will infuse your joints and make your exercise in later years very painful. So do it right now. Even if you exercise correctly to build muscle, if you don't eat more you won't get there. Capiche? To gain any weight, fat or muscle, you must eat more. To lose weight, fat or muscle, you must eat less. That's the simple part. Eat both carbs and protein before and after you workout. Eat carbohydrates (fruits, vegetables, grains, etc.) and protein (dead animals, milk, etc.) at both meals. Eat enough to gain weight (i.e. more than you usually eat). Don't be afraid of a little fat gain. Exercise to build muscle is worthless without rest. The exercise is what stimulates you body, but the rest is when that muscle actually gets built. I rest for a week or more between workouts. That's right - 7 day or more of rest after each workout! This might seem like a long time, but I know that I (and a surprising number of people out there) take a lot longer than you would think to grow muscle. This is especially true if you're just starting to workout. Your body doesn't have any conditioning built up, and it needs all the rest and recovery it can get. Make rest a priority. Sleep, good food, water, and maybe a multivitamin are great for actually growing the muscle you deserve to get after a brutally hard workout. • Click here to leave 'Exercise to Build Muscle: 6 Lifts I Use When I Want Results' & go back to the Home-page!